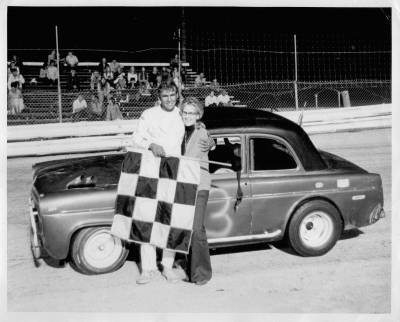 Fresh out of the army, Carl carries a checkered flag driving a Simca. This is what Hialeah looked like before the conctrete wall was put up around 1968. Just a month later, Carl had switched to English Fords, a model that would carry him to much success. Carl and his brother Ed Bowling pose for this shot in front of the massive Florida City grandstands. Note the tiny left front tire in this shot from Florida City. I suspect that Carl was setting his car up similar to the TQ's of the day. 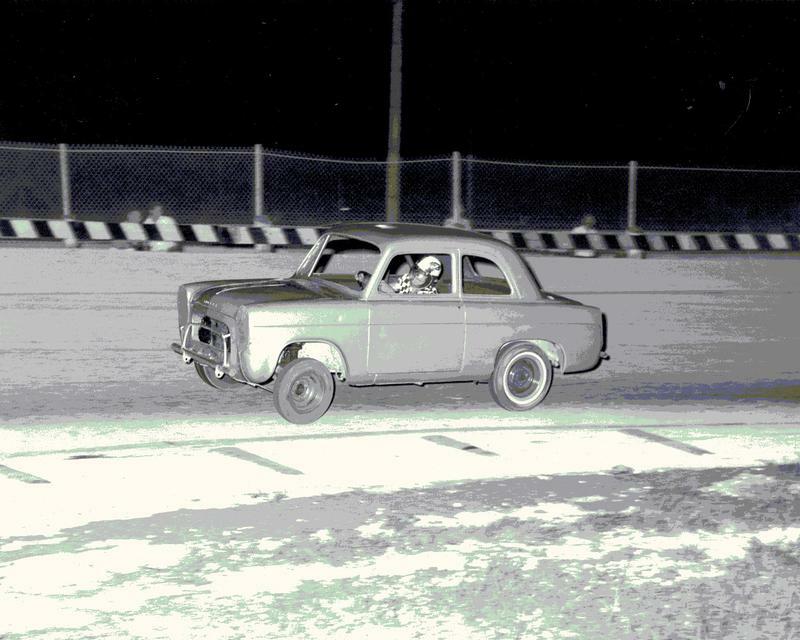 In those years, most of the TQ's ran a small left front and carried it high off the ground. In the early 70's, Carl and Ed anchored "The Bowling Race Team". 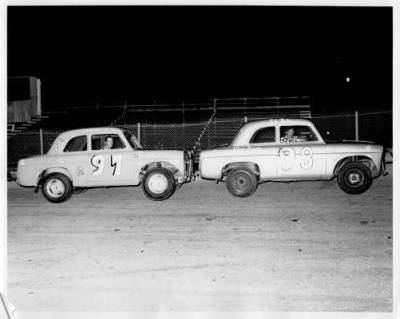 They often arrived at the track with 4 or 5 cars driven by assorted cousins and family members. The group was always competitive, and sometimes controversial, but they had much success. Carl and Ed did most of the winning for the team. The finer things in life! 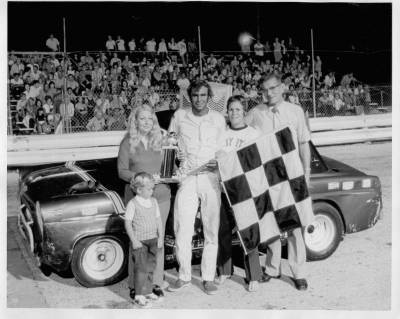 Patricia Hilton, Carl's wife at the time, joins him in victory lane. 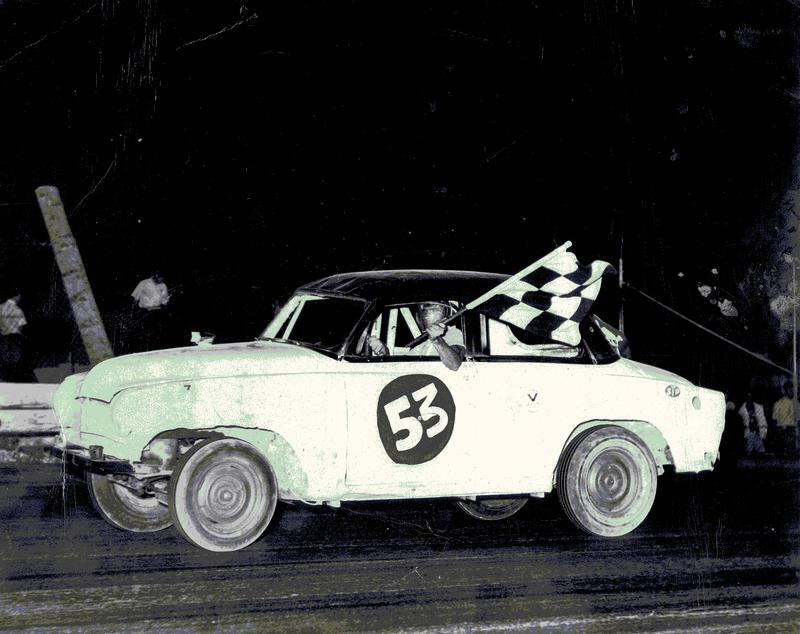 "Powder Puff" night and the 53 is still running strong. The driver is Carl's sister, Barbara Rogers. 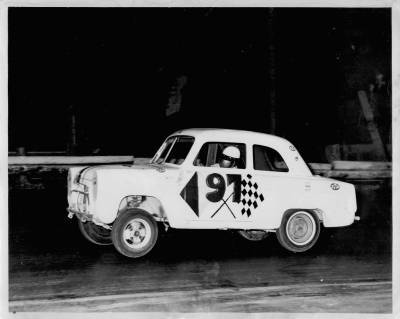 Barbara loved to race against her sister Joyce, who was married to driver Ed Hutchinson. 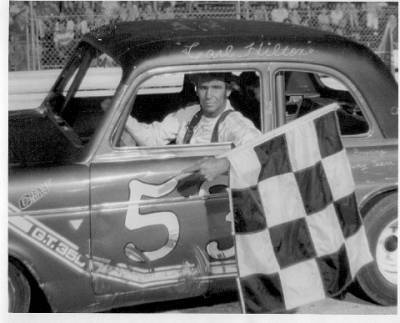 Ed Hutchinson was Carls brother-in-law. Here they mix it up in their "B" class Anglias. 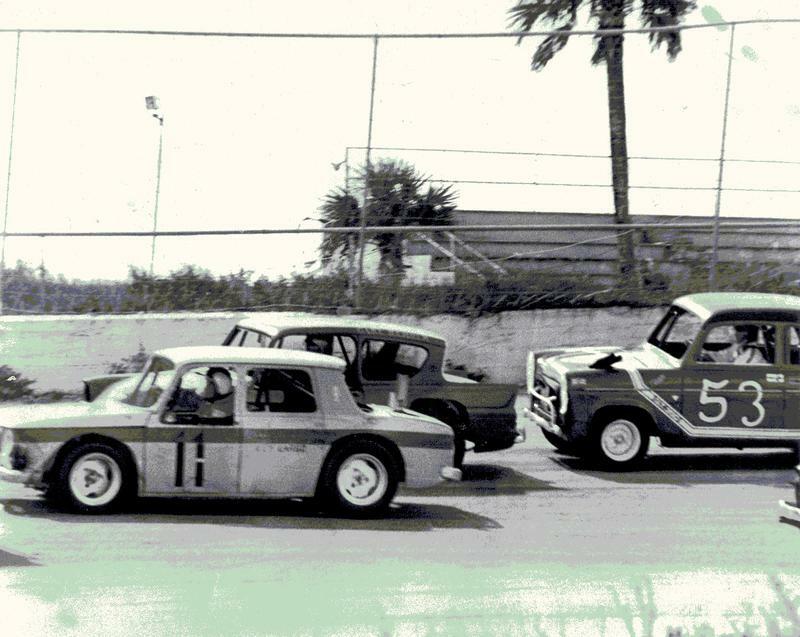 Hollywood Speedway hosted the minis this day. 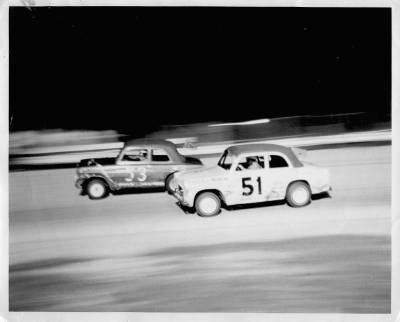 Carl runs in race traffic behind Gary Rehrer. At this point, Carl's racing days were numbered, but he continued to love speed. I understand he built some street Mustangs that were damn fast, and late in life he restored a basket-case pick-up. 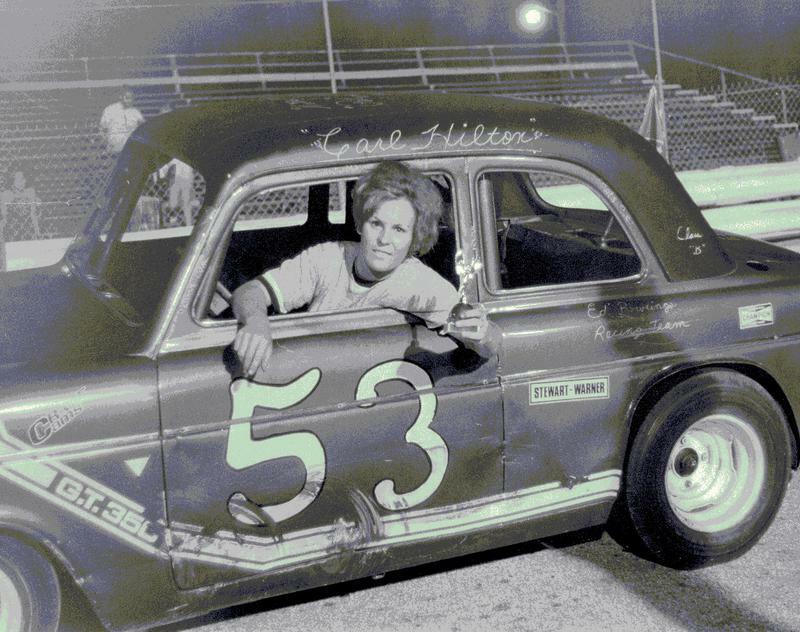 We lost Carl in September of 2001. Lots of family and friends attended a bar-b-que held near his home, not far from the old track. That day, they remembered a hard-driving guy, who had a great time and won lots of races.